Couple of days ago, you'd notice a change in the design of this website, picking a quality template wasn't easy but thank heavens, I made it after lots of tweaking here and there. Most fulfilling part was Feedback I got from friends like you reading this, my new design came out successful... right?. I had intentions of changing my blog's design this Year, honestly it's "Pretty Hard Work to make Your Blog or website Design Stand out", so I was Lazy about it Until I got A very Shocking Mail From Google Webmaster Tools on the 18th of March. 1.The straight Big Reason Why I got this mail was Because my Template wasn't Responsive as at that time 18th March, 2015. Internet Experts came up with a name for 21st April, they now call this day - "MOBILEGEDDON", the day so many Websites will be washed-off from SERP (Google's search Engine Result Page). So that email means if I do not Comply by April 21st, I'll be De-ranked from their Search Engine, my major Source of Traffic. I can't imagine such Tragedy happening to me, I haven't had issues with Google before, Not with their PENGUIN or PANDA Algorithm Updates and changes, I wasn't going to let this "MOBILEGEDDON" be my first big problem with Google. It took few weeks but I fixed it by Making this Blog Mobile and PC Responsive. and Shazam! I passed! Issue Resolved! What Can You Learn & Do from the Above Experience? 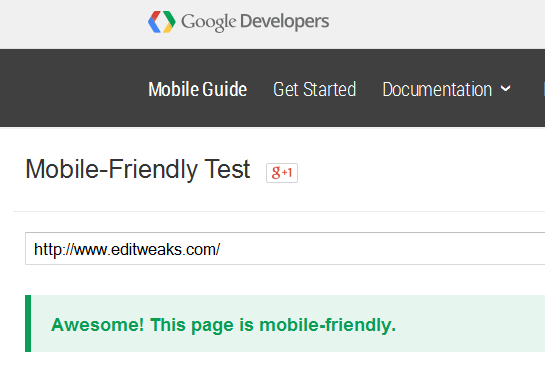 If you own a Website, or blog, please check your Mail if you have a Similar one as mine from Google Webmaster Tools, and Better Still, go to MOBILE FRIENDLY TEST and run a Test on your Blog or Website. Google is going to Take this very Serious, by April 21st, many Websites that are not Responsive will GO DOWN, and the Responsive One who Passed the Test will MOVE UP to First Positions on SERP. For Example: MR. A Website and MR. B's Website talks about the same thing, it won't be a matter of whether MR. A's Content is better than MR. B, if MR. B's website is Mobile responsive, Google will place Him higher than MR. A. Did You Use the Mobile Friendly Test? Did You Pass it? Are You already Doing something About Avoiding Mobilegeddon.